Are you looking for new ways to reward fans at the ballpark? Are you looking to create new ticket promotions based on team performance? This season, the Milwaukee Brewers are running a "Dollars for Dingers" ticket promotion where fans can save $1 off a Loge Outfield ticket (regularly $28) for EACH Brewers home run hitover a 10-day stretch of the season. The promotion offers fans the chance to save a lot of money on their tickets based on the team's performance (if the team hit 28 home runs during the stretch, fans would receive tickets for free). 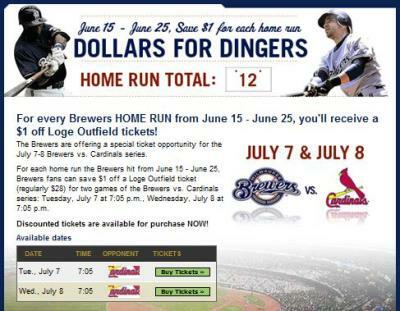 When the team offered the promotion from June 15 - June 25, the Brewers' power hitters slugged 12 home runs, discounting the price of the $28 loge seats to just $16 ($12 off) during a 2-game July homestand against the St. Louis Cardinals. Earlier this season, the team sold out their Dollars for Dingers ticket inventory in just 30 minutes, demonstratingthe strong support the promotion has received. Look for more teams to showcase discounted tickets based on team performance!